Two weeks after the defeat at Swansea and with the international break over United could finally get back into action on the pitch. 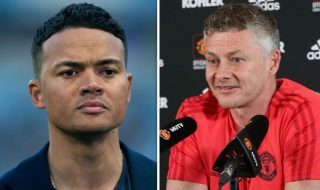 In the interim the void has been filled with much talk from journalists and fans; talk of alleged dissent amongst the squad, speculation as to whether Van Gaal is the man for the job. At last a chance for the team to do their talking on the pitch and who better to face than an old enemy. A victory here could significantly change the mood. Out: Romero, Rooney and Schneiderlin. Good first half, effective second half. United often took the wrong option in the first half but in the second were more direct in attacking Liverpool, taking more chances, losing the ball more but being more threatening and so effective. 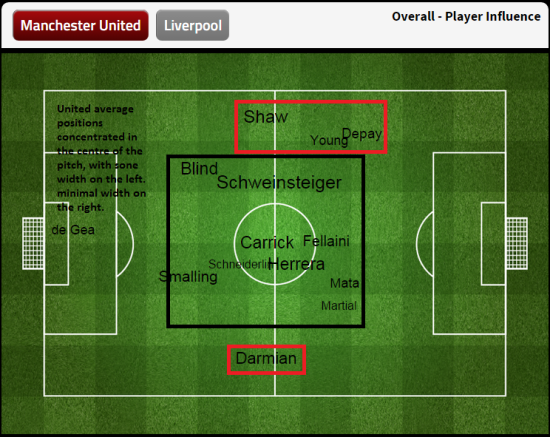 In the first half United did not threaten the Liverpool back line often enough, in the second half they did. Memphis played poorly in the first half and was replaced at halftime. Too often he choose the wrong option and missed the excellent runs of Shaw. Young was direct, running at Clyne and this lead directly to the first goal. After a difficult game at Swansea Daley Blind was excellent here; reading the game well he and Smalling faced the big front line (in stature) of Benteke, Can and Ings and they both coped well, staying in touch with each other and never allowing themselves to be isolated from each other. The defence was largely protected of course by the central midfield pair of Carrick and Schweinsteiger who are now developing a good understanding. They controlled the midfield and dominated Liverpool in the centre of the pitch. Schweinsteiger as majestic. 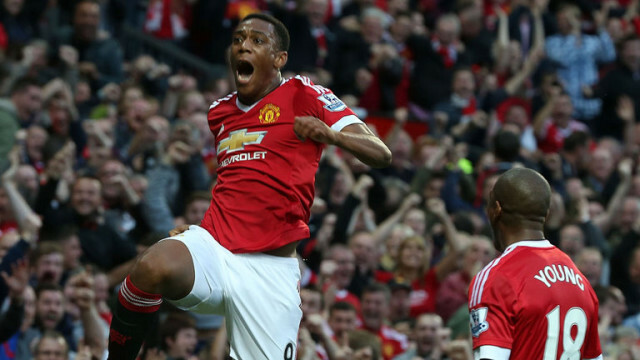 A glimpse of the future from Anthony Martial? A fantastic debut goal as Liverpool tired by United’s possession football visibly wilted, despite Benteke brilliant individual finish. United set up in a 4-2-3-1 shape, as they have done in all previous games this year. With the transfer window now closed and De Gea still a United player he made his first appearance of the campaign in goal. In central midfield Carrick partnered Scweinsteiger and Herrera occupied the number 10 position behind Fellaini as the single central striker. Liverpool set up as a 4-1-4-1 with Benteke as the lone central striker flanked by Ings and Firminio, but with Can looking to join him whenever possible. United soon took the initiative dominating possession from the start. They worked the ball well around the centre of the pitch with Schweinsteiger and Carrick controlling the passing. 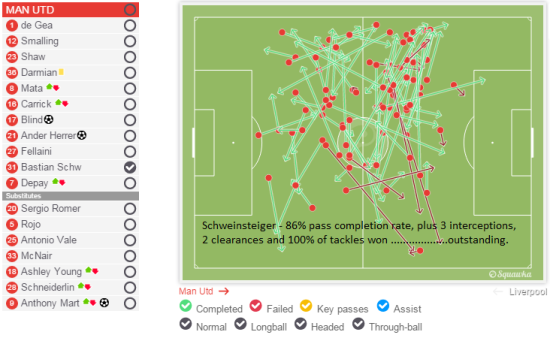 Scwhweinsteiger on the left tended to play further forward than Carrick on the right. 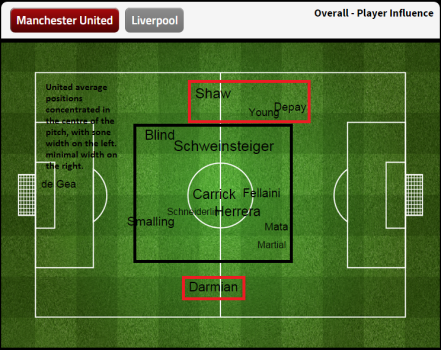 He was constantly looking to feed Memphis out wide and Shaw who often looked to get forward in support. As a consequence of this Firminio dropped back to support Clyne and prevent United creating overloads. Over on the over side Mata was tending to come inside and as a consequence United’s attack looked a little lopsided. United kept the ball for long periods, constantly recycling. Carrick and Schweinsteiger constantly recycled possession probing at Liverpool. The problem for United thought was that much of this good approach play was very deep with United rarely threatening the Liverpool box. It involved combinations with Smalling and Blind as often as with Herrera of Fellaini. This pattern continued for the whole of the first half with United dominating possession but not really threatening. There were the occasional moments when United threatened but these came from turnovers where United’s pressing caught Liverpool. Fellaini should have scored from one such incident after Mata won possession. There were three features of the first half worth picking out however. Firstly United did not use Fellaini well. On seeing the selected team we expected United to push Fellaini right on top of Liverpool’s central defenders to occupy them and push them back so creating space between the lines for Mata or Herrera to exploit. This never really happened and Fellaini wasn’t really in the game that much. 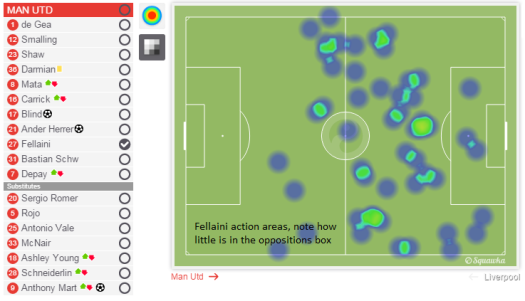 They rarely looked to pass into Fellaini, instead recycling possession in deeper areas. After a while, and perhaps frustrated Fellaini began to drop deep leaving United without a central presence on occasions at the front. This made life easy for Liverpool’s defence. The second point to make is that Memphis had a poor game. As discussed earlier much of United’s approach play probed at the Liverpool right where he was positioned. He always seemed to take the wrong option and did not stretch Liverpool in wide areas. Instead he tended to look to come inside into crowded areas and this was rarely effective. As he came inside Shaw, who had an excellent game would come forward to overlap. Memphis did not exploit this and rarely combined well with Shaw. Schweinsteiger was feeding all this and pointing to where the ball should go. Memphis didn’t respond. Scwheinsteiger combined well with Memphis and Shaw separately, but the three never really combined well together. Clyne did well to cope, but if all three had played together to try to get behind rather than come inside he would almost certainly found his task far harder. The last point to make is that United in dominating possession were stretching Liverpool. They may not have been creating many chances and they have been criticised for this n some quarters lately but by keeping the ball, stretching Liverpool and making them chase and cover they were clearly tiring Liverpool. Would they wilt in the second half? At half-time Van Gaal withdrew Memphis and introduced Young; no surprise after Memphis’s first half display. This substitution changed the game because now United ran at Liverpool, they became more direct and whilst in the first half they had stretched Liverpool now they stretched them to breaking point. Young over the last year has developed the habit of doing the simple things well. He gets the ball and he runs at pace at the defence, usually staying wide he tries to run behind the full back. In the forty nine minute he did that and Clyne fouled him wide on the left. Young took the free kick himself and in an obviously rehearsed routing Carrick and Schweinsteiger staring from the edge of the box charged the six yard box taking Liverpool players back with them and leaving Blind in acres of space on the edge of the box. Boom! He fired home powerfully with great accuracy after Young disguised his pull back from the free kick. 1-0. United were now on top and looked to exploit the situation. Their passing was now quicker and more probing than in the first half. They also took more chances and became a little sloppy in their play giving the ball away. Liverpool now had their best spell of the game, managing to keep the ball for periods of time, forcing several corners. From these corners Liverpool were dangerous. They are a big team. 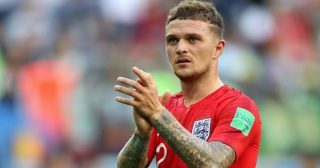 Benteke, Ings and Can are all tall powerful players and at set pieces they have the option of supplementing their threat with Skrtel and Lovren. United struggled to deal with this and De Gea was forced to make a couple of important saves in this period. This however was all Liverpool offerd in the game. They were generally poor. On 65 minutes Van Gaal made his second substitution replacing Mata with Martial. This involved a reorganisation of personnel if not shape. Fellaini dropped deeper to the number 10 position and Herrera moved wider to the right. 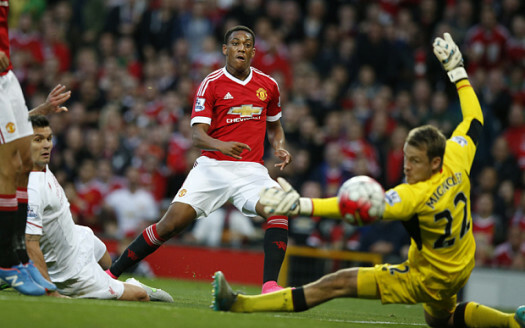 Martial led the line, but notably it was 13 minutes after his introduction that he had his first touch. By then United were 2-0 up. The second goal came from a penalty, Carrick played a delightful ball through the inside right channel for Herrera to run onto. He outpaced Gomez who fouled him. Herrera stepped up himself to power home into the top of the net. Boom! United’s second goal came in the 70th minute. Again this goal came from a United player being bold and making a forward pass and another being equally bold and running at Liverpool. Immediately after this goal Van Gaal made his final change replacing Carrick with Schneiderlin. 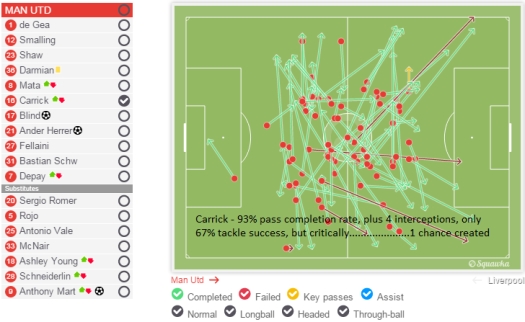 Carrick had an excellent 72 minutes in tandem with Schweinsteiger they had completely eclipsed the Liverpool midfield. 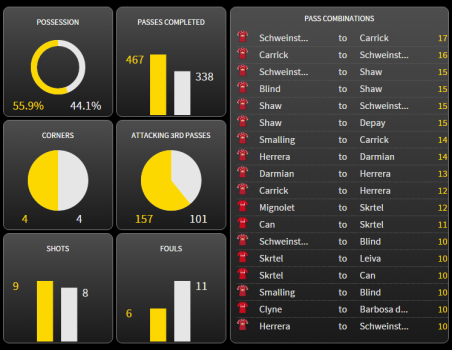 United now looked completely in control and looked to dominate possession. Liverpool looked a beaten team and as anticipated began to wilt. They looked exhausted as if their efforts to restrain United had seen them tire and killed their spirit. But out of the blue they scored. This goal came on 84 minutes and was so uncharacteristic of their performance. A cross in from their right was headed away by United unconvincingly; the ball fell behind Benteke who executed an exquisite over head kick. 2-1. Would this allow Liverpool the chance to steal something they didn’t really deserve from the game? No. Almost immediately Martial who had looked solid but unspectacular scored. Martial had worked the line across the full width of the pitch but was seen more on the United right than left. The goal came from the left. He was fed through the inside left channel by Young. Quite simply his pace and power took him past three defenders and he coolly finished past Mingolet as the Liverpool keeper came out to close him down. Boom! What a way to mark your debut. Game over. United dominated this game. In the first half their possession football did not threaten Liverpool often or directly enough. That changed after half time with the introduction of Young. All United’s goals came from running at the Liverpool back line and taking a chance. Boldness wins. What that first half football did however was tire Liverpool who wilted towards the end of the game. That is the aim of this strategy. In the second half United were able to take more chances because of their control of the game. This was in no small part due to the solidity of Smalling and Blind and the control of Schweinsteiger and Carrick. Both Herrera and Fellaini had difficult games in the number 10 role and generally United did not use Fellaini well when he played as the lone striker. The number 10 role is interesting because with Rooney injured there was a chance for Mata to occupy this role, but he didn’t being selected again on the right. Of course he came inside and played well when he got on the ball. In the first half the pace quickened when he got the ball. 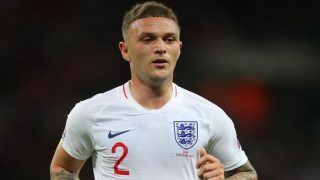 Much of his movement was square across the lines however, will he ever be given a chance to play centrally and direct play towards the opposition’s goal?